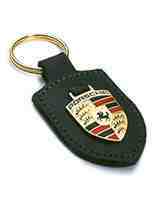 Real Leather Porsche Key Fobs for all Porsche models. Comes complete with leather fob, Porsche lgo emblem and stainless steel key ring. Replace that faded worn out key fob with a shiny new one! Make your Porsche keys stand out from the rest with a geunine leather key fob complete with attached Porsche emblem. Simple elegant design, durable and hard wearing.